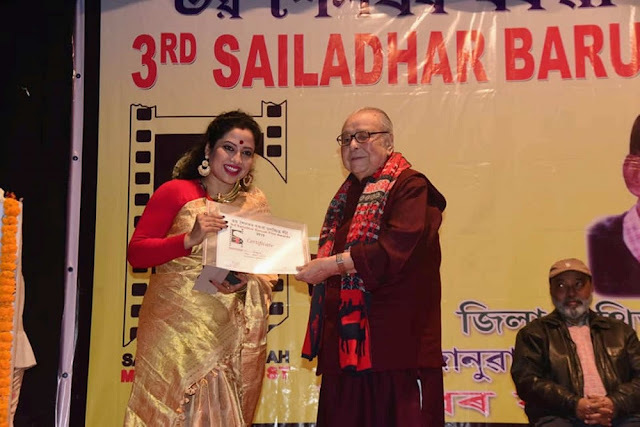 The third edition of Sailadhar Baruah Film Awards ceremony saw eminent film personalities being acknowledged for their distinct and crucial contributions to Assamese cinema. Assamese film ‘Ananya’ bagged three awards at the ceremony. While Arup Manna was adjudged the Best Director, Bijay Nath and Chandana Sarma bagged the Best Sound Designing and Best Actress awards for the film. ‘Ananya’ is a film that portrays an eschewed progressive take on the complexities of desire, sexuality and the female experience, that eventually undermines its own radicality by a retreat into the patriarchal value system. ‘Mission China’, the blockbuster hit directed by singer Zubeen Garg, bagged the Best Cinematography award for Suman Duarah and Pradip Daimari, and the Best Editing award for Pratim Khaund. Utpal Borpujari’s ‘Ishu’, based on noted writer Monikuntala Bhattacharya’s novel with the same title, bagged the Best Film Award and the Special Jury award for its young artiste Kapil Garo. On the other hand, Suren Mahanta bagged the Best Actor award for the movie ‘Phehujali’. Tarali Sarma bagged the Best Music Director award for the movie ‘Calendar’. Dr Jahanara Begum also bagged a Special Jury award for the movie ‘Seema-The Story Untold’.